(and guarded by an emu, no less! ), the staff are terrific and friendly, and on top of all that, there is the star attraction, Dinky the singing dingo! Our time here at Stuarts Well is limited and there is a lot that we want to see and do and so this afternoon we drove up to the Henbury Meteorite Craters. Along the way we stopped briefly at the Cannonball Run Memorial. Two competitors from Japan and two officials were killed in a tragic accident during the inaugural Northern Territory Cannonball Run in May 1994 and this memorial to the four men was erected on the exact spot where they died. Not surprisingly, there hasn’t been another Cannonball Run. It’s not far from the memorial to the craters but there is 11 kilometres (almost 7 miles) of unsealed road to negotiate first. It wasn’t that bad, more dusty than anything else and we arrived at Henbury little the worse for wear. A big hole in the ground! There are 12 craters and most of them are small but the main one was truly amazing. A huge chunk of iron, weighing several tonnes, hit the Earth at an estimated speed of 40,000 kph (25,000 mph), over 4000 years ago. It fragmented before impact and the fragments were scattered over a wide area, the largest leaving a whopping great hole in the ground! This crater is 180 metres (591 feet) wide and 15 metres (50 feet) deep and there’s an eerie feeling as you stand on the edge, a feeling that you are seeing something alien. And that’s precisely what it is; it travelled from the interstellar outback and came to rest here. Man can only dream of making such a journey. There is only so much time you can spend looking at a hole in the ground, no matter how amazing it is, and so we left the craters and made our way out to the Rainbow Valley Conservation Reserve. Along 22 kilometres (14 miles) of yet another unsealed road, we passed some amazing examples of Central Australian flora, including desert oaks and grevilleas. Rainbow Valley is breathtaking; there is no other word to describe it. The claypan stretches over a kilometre (0.6 mile) in length and the spectacular sandstone cliffs of the main formation stand right on the edge. Nothing quite prepares you for its majesty. The free-standing formation is made up of some dramatic rocky outcrops and is thought to be around 350 million years old. There was not a breath of wind and the silence was broken only by the buzzing of the flies. I think they lie in wait for unprotected faces; yes, I forgot my fly veil! We walked across the claypan to the base of the cliff and even climbed up a few of the rocks. There is a climb to the top but we thought better of it. Rainbow Valley is very isolated and we were the only people there. If one of us should be hurt climbing to the top, it’s a long to get help. 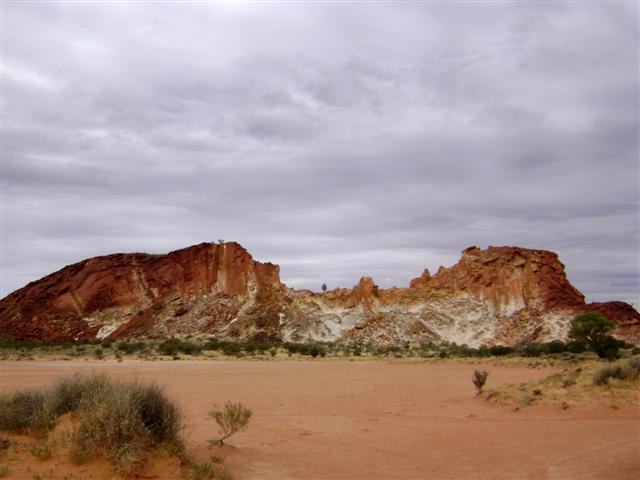 The colours of this saw-toothed ridge extend from a bleached-white sandstone at the base though yellow and orange to a deep red capping at the top due to the iron oxide that is dissolved by water in the artesian basin and drawn to the surface and higher rock levels. The bluff is most impressive at sunrise and sunset when it takes on a golden glow but unfortunately this day was overcast and so we missed seeing it in the setting sun. Even so Rainbow Valley is still a truly magnificent sight and something I wouldn’t have missed for anything in the world. By the time we returned to camp the day was well and truly on the wane and we stopped at the roadhouse bar for a drink where we were treated to a show from Dinky. 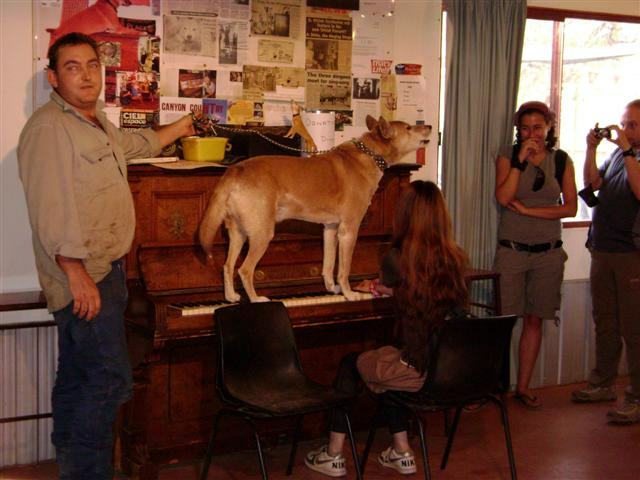 Dinky is the world’s only singing dingo and he’s been serenading tourists at the roadhouse for over 8 years. Dinky’s owner, Jim Cotterill, also owner of the roadhouse, has owned Dinky since he was just a pup. He does actually sing along when someone plays the piano. A young girl, a tourist, sat down and started to play and the dingo jumped up onto the keyboard and started howling. He was terrific and looked like he enjoyed singing along. Of course, he could have just been a music lover! 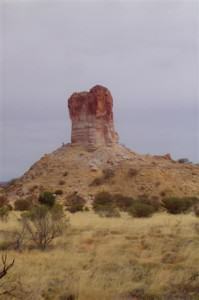 Pillar, approximately 150 kilometres (93 miles) from Stuarts Well. We took the Hugh River Stock Route, an unsealed road, which is a far better road than any other tracks we’ve been on (see previous entries for the Oodnadatta Track) and even though it was one long stretch of red earth, some of it loose, soft sand, we made good time. Eventually we turned on to Old South Road which was rougher and sandier and after another hour reached Maryvale Station. 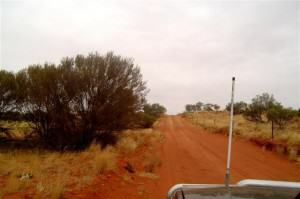 There is a store and fuel supplies here but we decided not to stop and continued on through Titjikala Aboriginal Reserve. Titjikala is an alcohol-free zone and the Aboriginal Elders are quite strict about this. There are no fences around the reserve, that we could see anyway, but the piles of empty beer cans showed just where the perimeter is! Having said that, we found the few folks we talked to, when we took a wrong turn, friendly and helpful and we couldn’t ask for more than that. Just past Titjikala we turned onto the road to the pillar and this is where it became interesting. Deep sand drifts and tall sand dunes on a slightly narrowed road meant staying very alert for oncoming traffic. There had been, since we first started on the stock route, many gates to pass through. Now you always leave a gate as you find it. If it’s closed when you approach it, close it again after you pass through; if it’s open, leave it that way. On the last gate we’d passed there had been a sign warning us to keep our CB on UHF10 for oncoming traffic and to call on the general band as we approached each dune. As luck would have it we encountered a couple of 4×4’s towing camper trailers. They hadn’t called ahead but we were able to pull off to the side to let them pass. Finally we arrived at Chambers Pillar and what a magnificent sight! The main feature of the Chambers Pillar Historical Reserve, it is a 50 metre (164 feet) high sandstone column that has been eroded by forces of nature into its present configuration over 350 million years. We followed the path to the pillar and walked around the base. Amazing! It’s a long climb up the stairs to the viewing platform but well worth it when you get there. We had some outstanding views of other sandstone monoliths, most notably Castle Rock, a mere 500 metres (1640 feet) away. In the early days of exploration, before the coming of the railway, the pillar was a landmark in the desert on the long overland journey from Adelaide to Alice Springs. 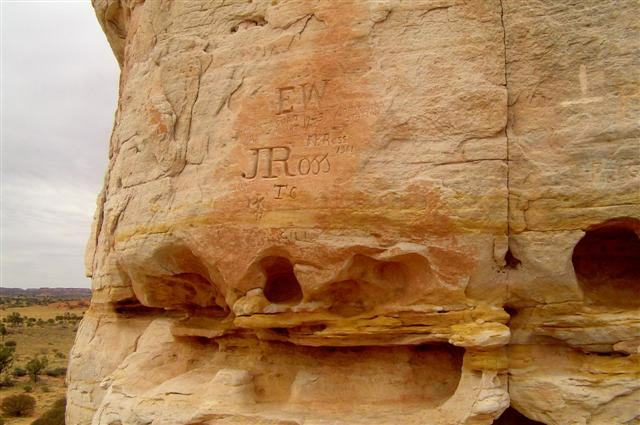 There are a number of names engraved on the pillar from the early explorers, some as far back as 1870. They did this to keep a record of their visit and to mark the pillar as an important landmark. The more recent engravings are just graffiti and are very illegal as it lessens the historical significance of the area. 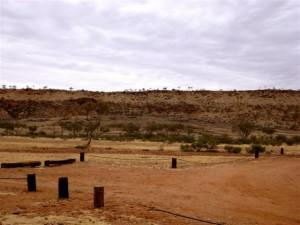 This entire area is also a Site of Aboriginal Significance and the following is an interesting Dreamtime story about the pillar. It was now late in the day and we didn’t think it would be too long before the tourist buses started arriving for the sunset viewing; like Rainbow Valley the pillar glows gold in the setting sun. But as it turned out, there were no buses this evening because an Aboriginal ceremony was scheduled to take place at the pillar. Chamber’s Pillar is of huge historical and cultural significance both to the white man and the Traditional Owners of this land. To them, it is a symbol of the need to observe the kinship laws and as a mark of respect we decided to leave early. With more than a 3 hour trip back to camp, that wasn’t such a bad idea anyway. We arrived back at camp in the early evening and sat out by the pool with our bottle of Two Tails Sparkling Wine for our “first night” ritual. Now, I know it wasn’t our first night but we wouldn’t have missed Dinky’s show last night for anything. We decided to have dinner in the roadhouse that night. 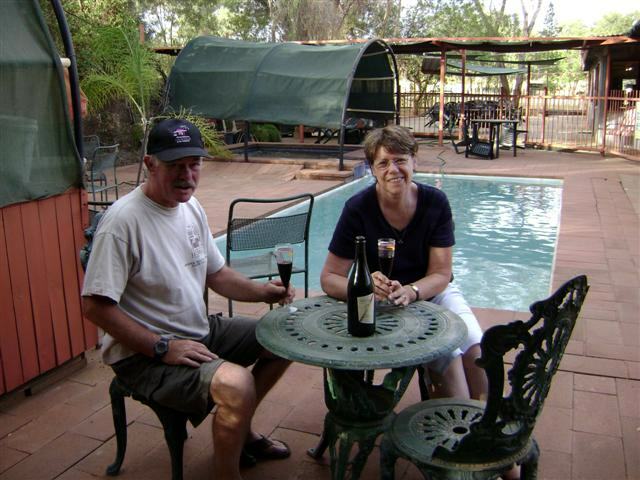 Owner Jim Cotterill has a photographic history of tourism in Central Australia that is most interesting. The Cotterill family are well known in this area and have been running tourism businesses around here for over 50 years. In fact, the Cotterills cut the first road to Kings Canyon and ran the original resort there for a number of years. We thoroughly enjoyed ourselves that evening; a delicious dinner, a fascinating conversation with Jim, and, of course, another serenade from Dinky. 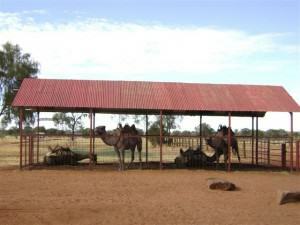 duration to 5-day safaris through the outback. Seeing the heart of Australia from the back of a camel would be an interesting experience, to say the least. 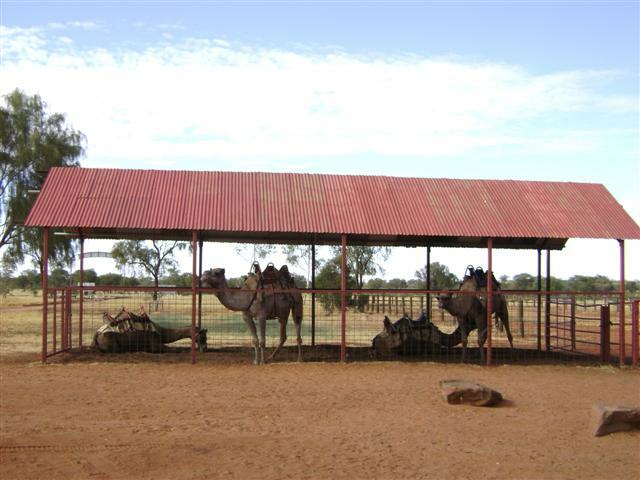 We wandered over to the camel farm for a few minutes as we prepared to leave Stuarts Well the next morning but, unfortunately, we were too early and they weren’t open; it might have been fun to have a ride so perhaps we’ll put that on our list of things we must do if we ever come back. Or not. 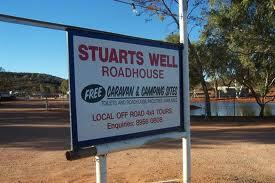 Stuarts Well Roadhouse. 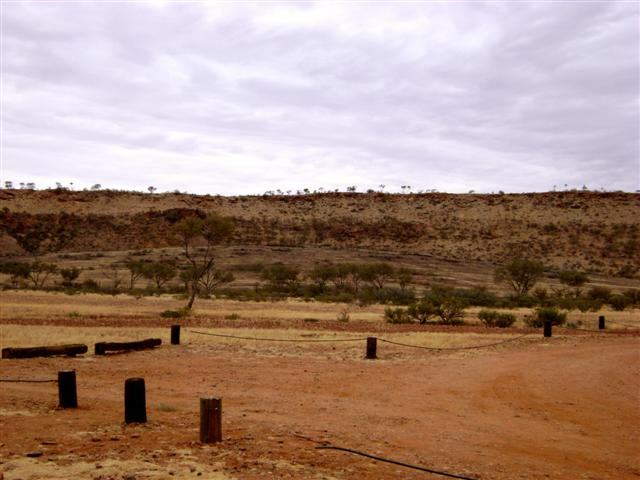 What you see is what you get, basic and very outback. 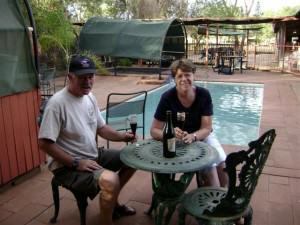 But it is also one of the best places we’d stayed at on our travels in the Northern Territory. There’s an underlying magic here and much more to Stuarts Well than meets the eye.